Prof. Y.P. Abrol, President ING-SCON (Indian Nitrogen Group), Former Head of the Division of Plant Physiology at the Indian Agricultural Research Institute, Hamdard University, India. 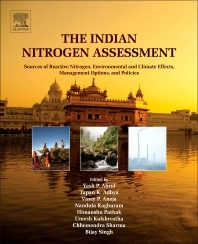 Professor Abrol’s exhaustive Analysis on nitrogen fertilizer use contributed significantly to the 'understanding of the 'regulation of nitrate assimilation'. Professor Abrol worked out a complete N balance sheet of wheat and barley, which formed the basis for understanding and recommendation for optimal utilization of Nitrogen. He published more than 150 research papers and several review papers in different Indian/International Journals, and also edited 15 volumes of publication in various fields relating to agricultural and plant studies. This Indian N assessement is a very interesting and accurate follow up of the European N Assessment that was published back in 2011. It is very important to have these assessments at the international level, but by countries which is the case. Thank you to Elsevier to do this pubblication. It would be acknowlegeable if Elsevier could have special conditions to stimulate the publication of N assessments from other countries.